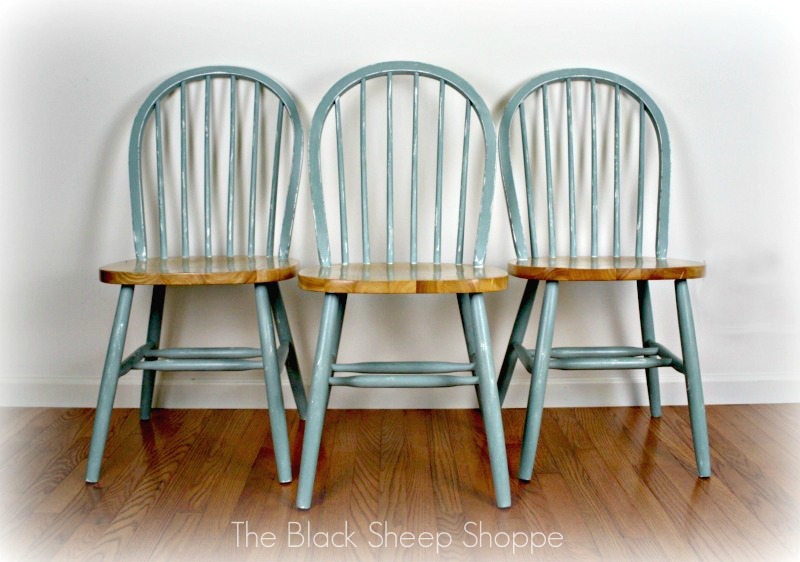 When painting chairs it's so much easier to paint them in all one color. 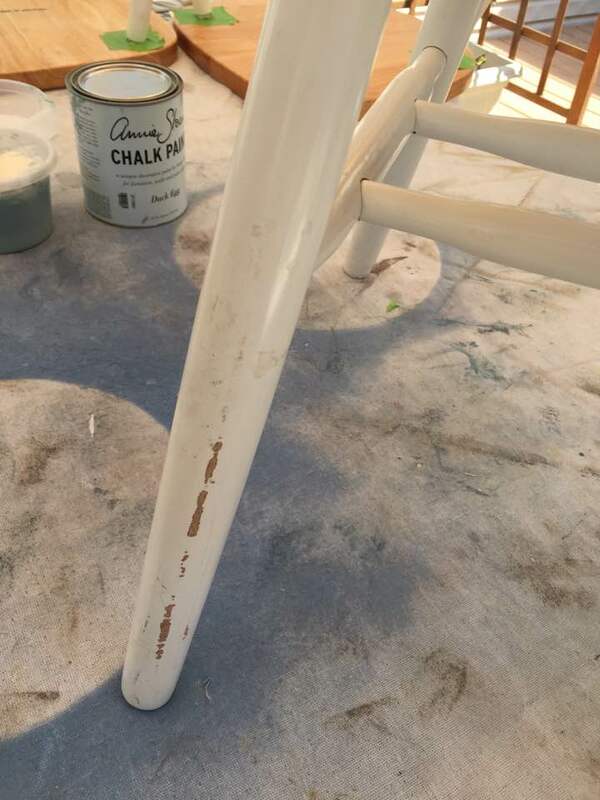 But if you want the seat a different color or stained then you'll have to deal with painting around the spindles. 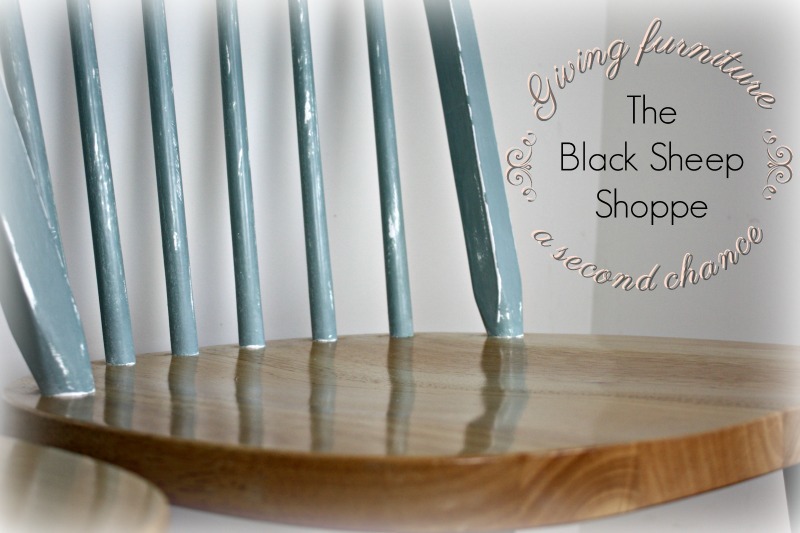 Today I'll share how I tape off the spindles quickly to get a nice crisp finish. The "before" shot doesn't really show the damaged to the original finish, so I'll include a close up of one section. 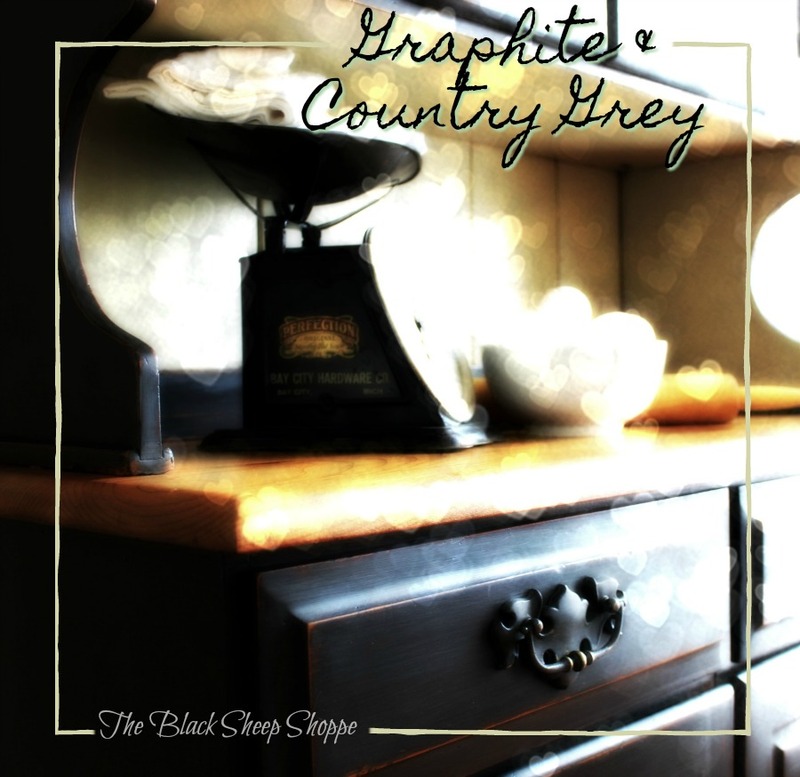 It's normal wear and tear that just about all furniture experiences. But there's no need to toss it! A fresh coat of paint will make it like brand new. Example of damage to original finish. 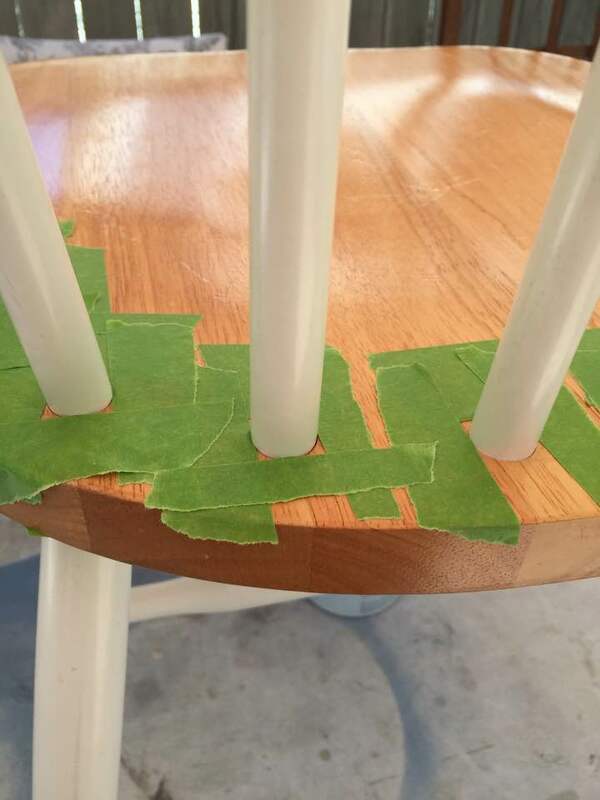 I found the best way to get a crisp edge around the spindles is to tape them off with painters tape. 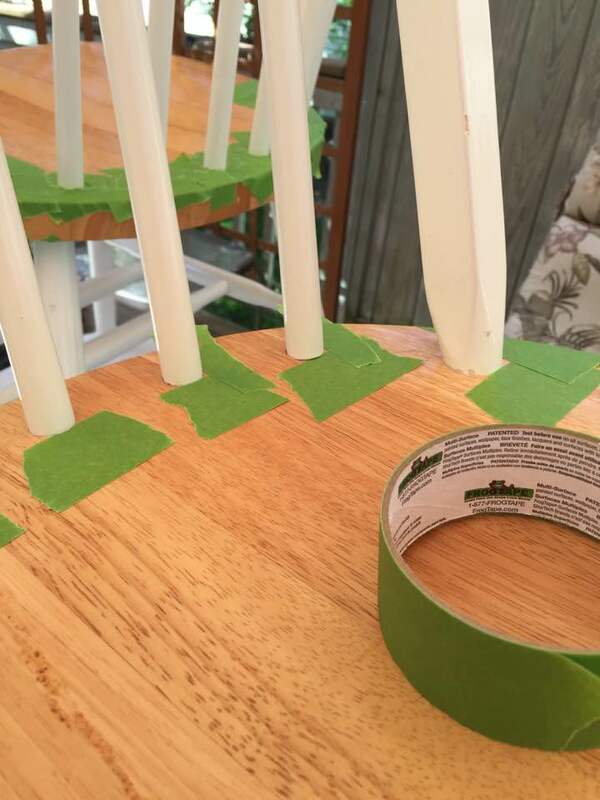 Each chair has 12 spindles (8 on top and 4 underneath) that needed to be taped off. 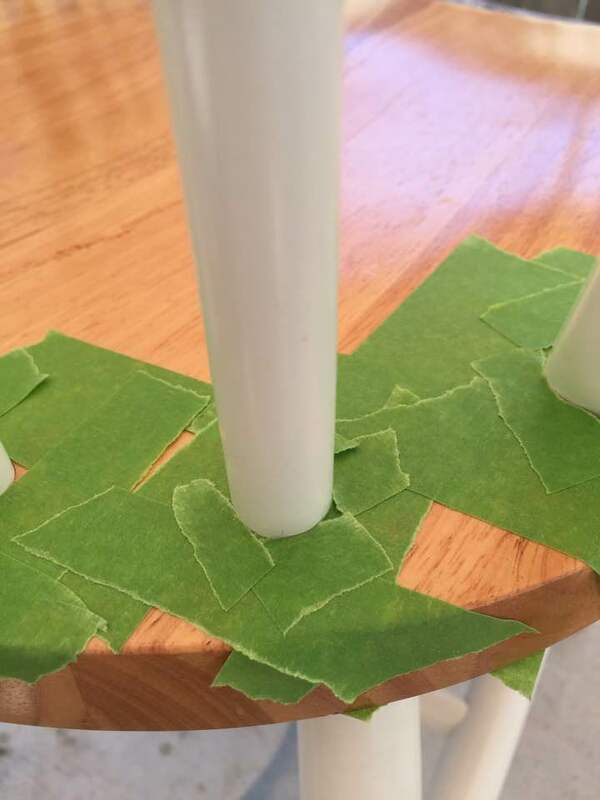 Although the spindles are round, I begin by taping off a square. 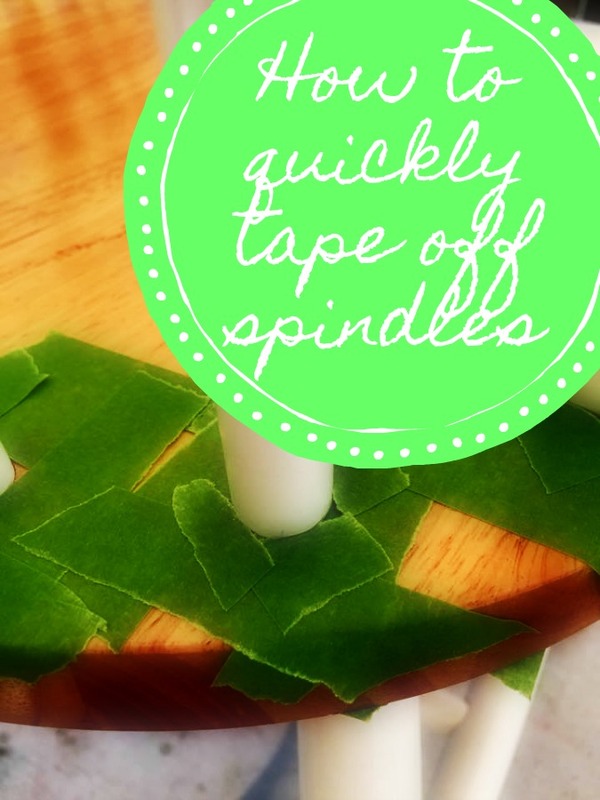 First I put a piece of tape at the front of each spindle. Next I added another piece to the side of each spindle. 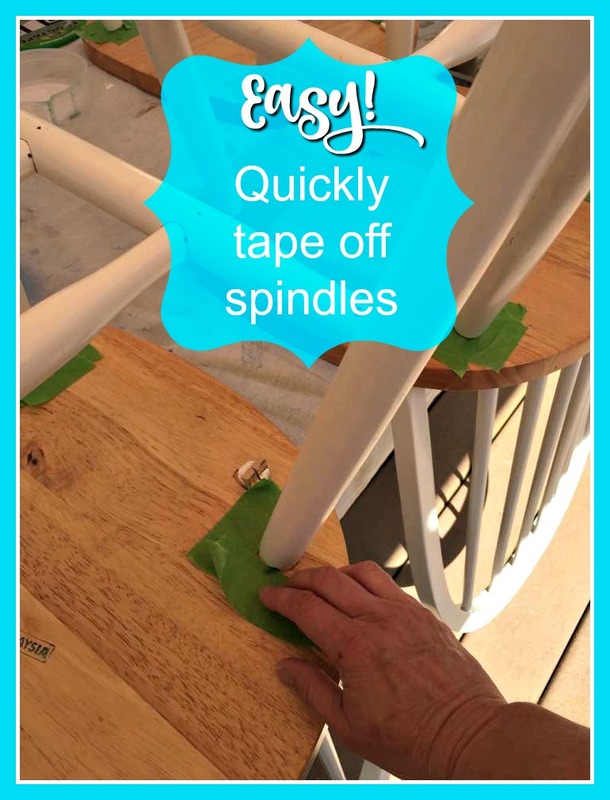 Begin by taping off the front of the spindles. I added a third piece to the other side of each spindle, and then a fourth piece of tape to the back. Finally, I filled in the gaps around the circle with 4 small pieces of tape. 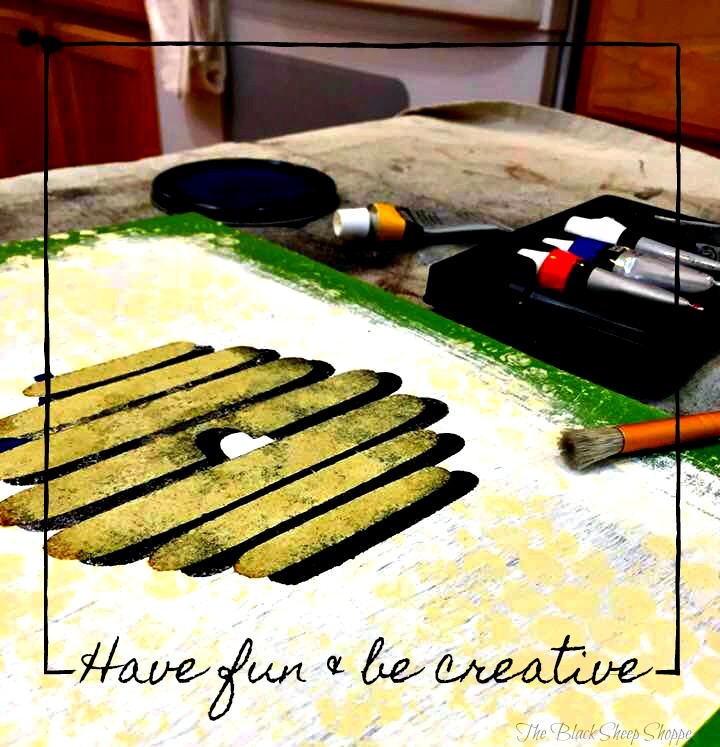 Use four small pieces of tape to fill in the gaps. 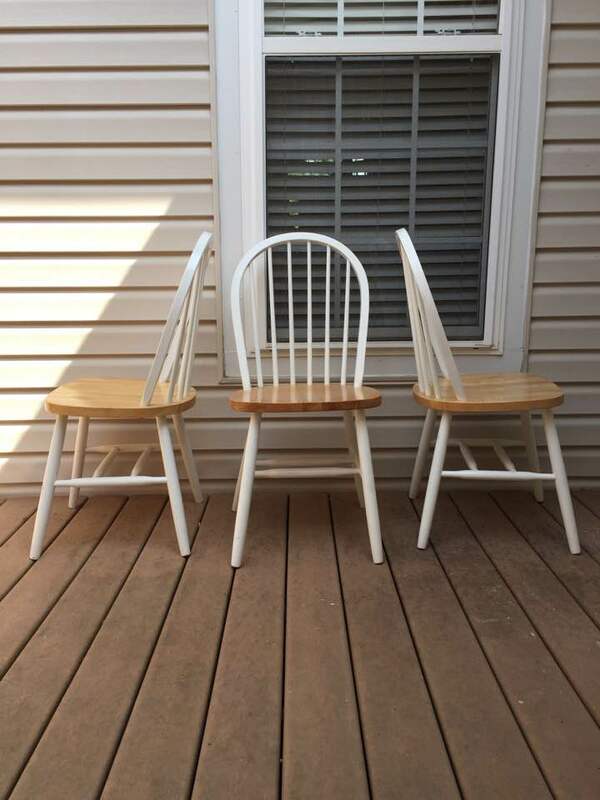 Prior to painting I also repeated the process underneath the chairs where the spindles meet the seat. Repeat for spindles underneath the seat. 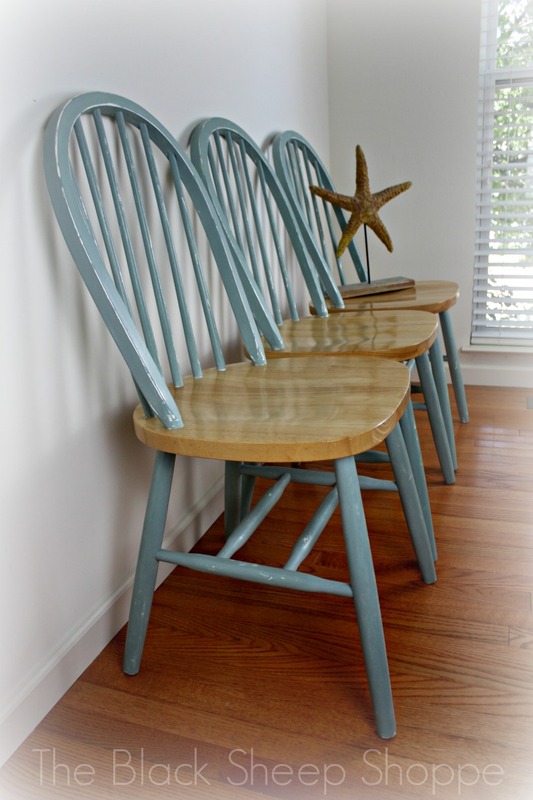 The chairs are painted with two coats of Duck Egg Blue. I used a fine sanding sponge to lightly distress the blue to reveal the white underneath. 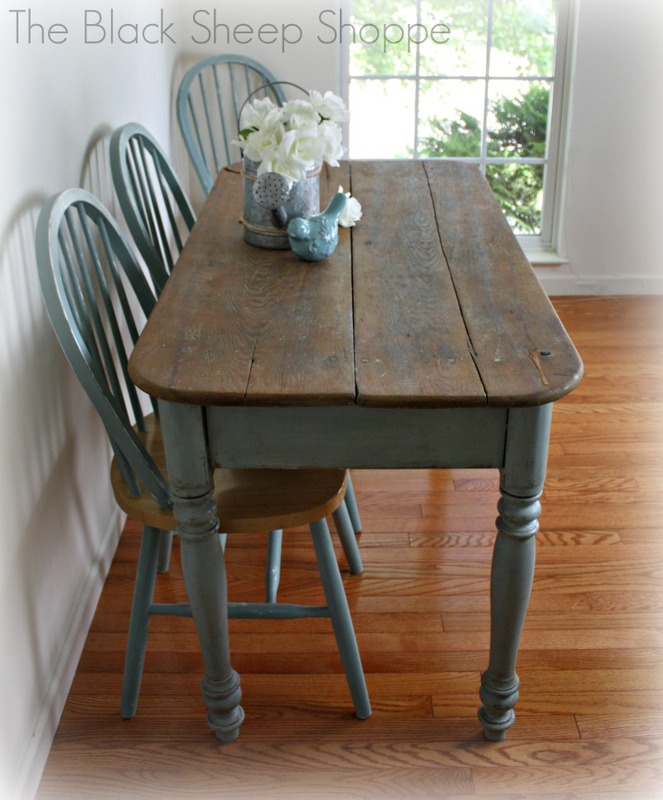 I love the way the blue and white look with the natural wood. Duck Egg Blue paired with natural wood. Shop towels and Lint free shop rags for removing excess wax.